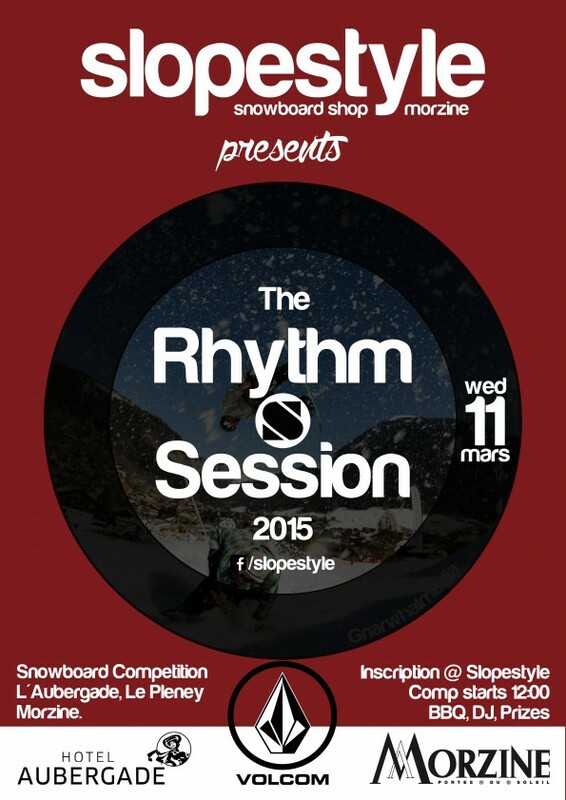 Morzine’s favourite snowboard competition is back for the 3rd year, and it’s bigger than ever! What happens when you get a tonne of amazing riders together, dj’s, bbq’s and a skatepark influenced course at the back of L’Aubergade? The mighty Rhythm Sessions 2015! Anyone who has spectated or competed at the last 2 events knows the vibe; high-energy, fast laps with a ‘go big or go home’ attitude! People really throw down, seeking alternative innovative lines and getting creative with tricks to wow the judges. The course is shaped the night before using a piste basher and a army of shapers at the back of L’aubergade, and this year we are showing a Volcommovie on the big screen to get people stoked to ride the next day. In the morning the competitors register (after inscription at Slopestyle which is currently live) and have a brief about what the judges are looking for. Each athelete gets a Red Bull to give them wings for the event and when the tunes start playing the session is on! Volcomand Skullcandy will be there in full support giving away free stash while the spectators kick back, enjoy L’Aubergades bar and Red Bulls outside bar on the hotel terrace. After the session is over it will be off to the official afterparty at Chez Rogers where the winners of each catorgory will be announced followed by the days edit which will be filmed and editing during the session. Then the party will flow long into the night! Previous: The Alpine Challenge – Get Olly on skis!